All transactions are safe and secure with a reliable history in online purchasing behind each of our associates. Buy the Kellerman's t-shirt to own Dirty Dancing clothing and merchandise. If you have ever wondered where a wealthy doctor takes his family for a summer vacation, look no further. Kellerman's resort is nestled in the Catskill Mountains and is full of fun family activities, including dance lessons, magic shows and potato sack races. 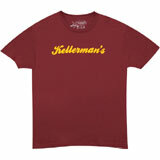 You can be one of the gang too with this Kellerman's t-shirt worn by the employees. The friendships will last as long as the mountains stand. In addition to the Kellerman's tee above, browse the Dirty Dancing Clothing Gallery for more apparel like men's and women's clothes, kids shirts or hoodies.